While we stand by our claim that there is not a more influential endorsement a restaurant can receive than one from this site, we’ll admit that a seated and former president can probably compete. If you’ve ever been to Il Mulino, you can probably guess that Bill Clinton was the one who picked the venue when he and Obama lunched there recently. Il Mulino is definitely a Slick Willy kind of place. The restaurant is a New York institution. An alpha-dog hot spot that most people around town will passionately defend as the best of it’s kind, even though the service is cold and the food heavy handed and extravagant. It’s a place that even though will piss you off at times, you still love it. The Bill Clinton of restaurants indeed. Eating at Il Mulino is an exercise in tolerance. You’ll have to tolerate a lot to eat some good, though incredibly rich and over the top Itlaian food. The surly wait staff, impossible to secure reservations, ridiculously expensive everything - read a Zagat’s and it seems that all is forgiven with a little bit of Clintonesque charm. 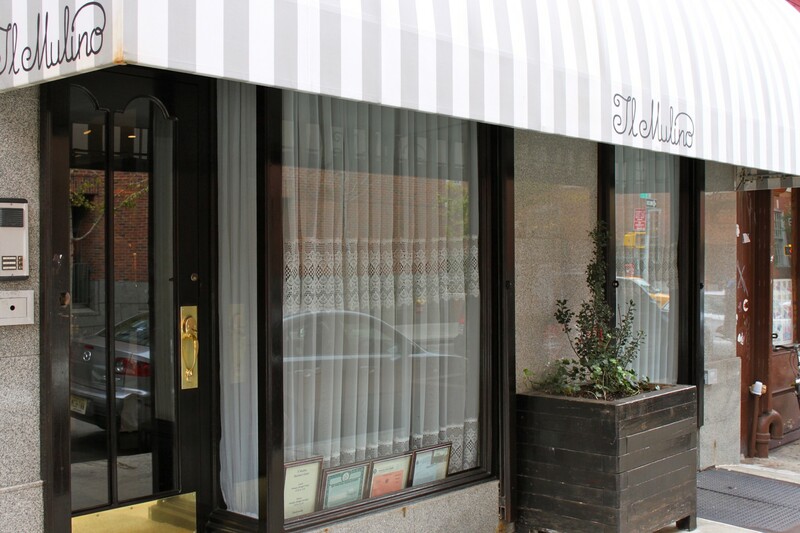 Il Mulino definitely isn’t an Infatuation favorite, but as we do with Bill - we’ll give some credit where credit’s due. From the moment you sit down, a parade of antipasti will appear before you. The bruschetta is good, but loaded with garlic, and the mushrooms and cured meats are nice as well. Between this and the bread, you’re likely going to be full before your waiter takes your order. Probably the best Caprese I have ever had, and probably because it’s not covered in black truffle sauce or red chili flakes or gold dust like everything else on the menu. Another nice and simple dish, this one is heavy on the garlic, but good. I love cannelloni, but the béchamel here puts a hurting on you after about two bites. This could probably provide one day’s sustenance for a small village. Another recommendation based on relative simplicity. The shrimp are perfectly cooked and huge. Be warned though that the fra diavolo sauce is very spicy. Capellini pasta with wild mushrooms, pancetta, sweet peas, vodka cream sauce, and black truffle. This is one of those ridiculous things in this world that probably shouldn’t exist. Like fried Oreos.